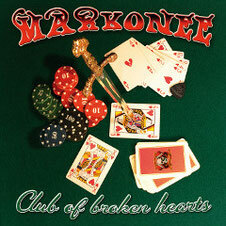 Italian five piece band MARKONEE will release their third album "Club Of Broken Hearts" through New Venture Music on June 14th. The band was founded by guitar player Stefano Peresson (ex-Danger Zone) together with guitar player Carlo Bevilacqua back in 1999, and the band name was adapted from the Italian radio pioneer Guglielmo Marconi. MARKONEE's sound carries on the Classic Hard Rock in the genre of their favorites such as Winger, Ratt, Warrant, Skid Row, Pink Cream 69, Firehouse and Gotthard. So far the band has released two records, "The Spirit Of Radio" (2006) which is a concept album about the invention of the radio, and "See The Thunder" (2009) which was mixed and mastered by Beau Hill (Alice Cooper, Europe, Ratt, Winger). MARKONEE toured mainland Europe and the United Kingdom extensively in support of their second album, performing dozens of shows with the likes of Winger, Gotthard, White Lion, The Sweet, Molly Hatchet, Tyketto, Soul Doctor, Y&T, L.A. Guns, House Of Shakira and Michael Schenker Group. "Club Of Broken Hearts" marks the recording debut of singer Alessio Trapella, who joined the band in 2011. This time it was mixed & mastered by Roberto Priori (Danger Zone, Wheels Of Fire), and also features Michele Luppi (Los Angeles, Secret Sphere, ex-Vision Divine) as a guest. The album sees the band rocking a little harder than on their previous record, offering driving guitars, majestic vocals and a driving big time groove.